Praying for believers on campus to have a passion for the mission of getting the Gospel to the unreached of the world. Bring them into the process of PRAYER and NETWORKing as well. This is the process of simply learning about the campus and students on campus. What is the spiritual climate of this campus? What is the best way to discover spiritual interest on campus? Where do students hangout? How do we engage them in spiritual conversation? How is our college unique? What makes it especially difficult to discover spiritual interest and follow up with students on our campus? What makes it especially easy/fruitful? What are the needs of our students? What are some ways we can love them and build relationships? Discovering spiritual interest on campus. The goal is to find a few believers who want to live their faith. Discipling these key students will equip them to disciple others and to possibly be key leaders in the movement on campus. A key part of discipling these students is equipping them to be doing evangelism and disciple-making themselves! Starting small by focusing on a few key students is a very purposeful approach to starting a movement on campus! After discipling a few key students, form a few Bible studies on campus with these key leaders as Bible Study leaders. These Bible Studies can then be communicated as opportunities for students on campus to connect with other believers. Once you have a few small group Bible Studies formed, gather at least 5 key student-leaders (those who have been discipled and are actively sharing their faith and discipling others on campus) and form a leadership team that meets regularly. If you already have several Bible studies happening, you have a decent group of students connected to the movement. Now is the time to bring them together (probably weekly) for worship, teaching, and fellowship. This is a key aspect of a movement as students are longing for community. You will find that this Big Group becomes another avenue to introduce students to Jesus, but the goal is still to connect them to Bible Studies and then to being discipled. The leadership team discusses the unique characteristics of your movement and therefore the unique approaches to making disciples and reaching every student with the Gospel. 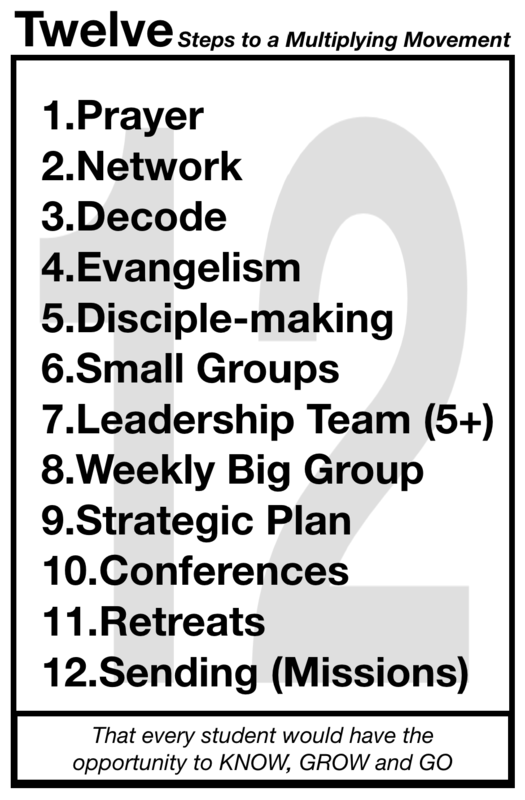 The Strategic Plan most likely includes an annual calendar / timeline for evangelism and disciple-making on campus. Often it is at these conferences that students make significant life-altering decisions to live their lives for Jesus (to go on a mission trip, for example). Retreats are also a valuable time to get students away and focused on living for Jesus now and in their future. Our experience is that retreats have a significant impact on the spiritual lives of college students! As students come alive to The Great Commission, they GO. We have the opportunity to come alongside the Holy Spirit as He challenges and equips them to be World Christians.